A giant, molded, blue wave that peaks on both ends divides the arriving audience into two halves as a young man and woman -- both bare-footed, loosely clothed – silently cuddle, lounge separately, and run up the wave’s opposing crests, only to slide back down. The dance-of-sorts continues a full fifteen minutes before the play actually begins, setting a tone for the next seventy minutes where the realms of reality and dream, awake and sleep, earth and sea mingle into mystical haze. Taking a well-trod fairy tale revisited in many forms -- literary and dramatic -- since its original appearance in an 1811 novella (Undine by Fredrich de la Motte Fouqué), Katherine Sherman explores how unconnected to reality two people can be when deliriously lost in a first love. Cutting Ball Theatre stages this world premiere in a form that often seems more like a choral poem of intertwined chants and soft movements than a developed play with plot line and dialogue. As the story of old goes, our knight decides it is time to get back to his quest, leaving Ondine to keep testing her newly discovered eyelids (things not needed underwater) to see if when she closes/opens them, he will suddenly appear. Things start going downhill at this point for her, and eventually boredom and anger will lead to a decision that will not bode well for Hildebrand or her when he finally does return. The returning, exhausted knight finds that falling to sleep will mean death, and most of the rest of the play involves many ploys by Ondine to keep him awake. Both of the key actors bring intense energy, a sense of spontaneity, and a walloping amount of tragic naiveté to Ondine and Hildebrand. But with the script given them, there is only so far they can develop their characters. Often their dialogue is short, choppy, and not saying a lot or it crosses into the more metaphorical, poetic realm that is mesmerizing and musical but not particularly intriguing. Into Ondine’s world come three sisters of the sea: Mist (Marilet Martinez), Ice (Danielle O’Hare, and Rain (Molly Benson). Individually and collectively, they show up repeatedly to tell Ondine, “It’s time ... We miss you.” They each pop out of the oddest places in Michael Locher’s innovative set. They also come with their natural element in tow (enhanced by Theodore J.H. Hulsker’s sound and by Megan Finley’s costumes), willing to indulge a while with Ondine in chitchat and in the pleasures of a hot cup of tea or a fresh scone. Together, they become a Greek-like chorus with full poetic phrases that warn and describe but do not say much even though they sound nice. The synchronous swells of their half-submerged bodies (choreographed by Liz Tenuto) reenact their beloved sea. The slow back and forth swaying combined with a choral flow that is more chant than conversation provide enough hypnotic powers to cause more than just a few yawns among the mesmerized (and maybe in some cases, bored at this point) audience. Rob Melrose directs a world of dreams that proceeds in out-of-this-world manners to an expected ending that falls rather flat. Like a state of half sleep, half awake, some of the dream is clear and interesting; and some of it fades into elements that cannot be quite recognized or understood. 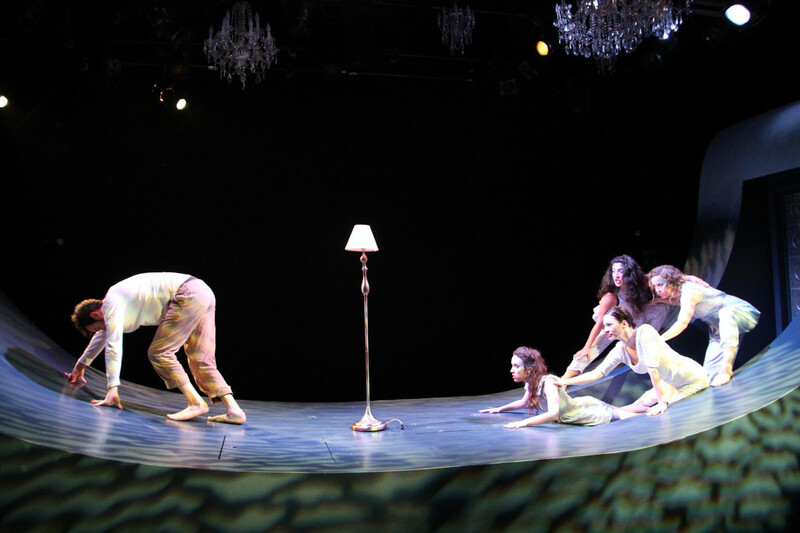 As an art piece, Cutting Ball’s premiere of Ondine is an exhibit with some value in observing. As a new play with a story that captures and holds attention with characters we come to know and care about, this Ondine falls short. Ondine continues through March 6, 2016 in world premiere by Cutting Ball Theatre at the Exit Theatre, 277 Taylor Street, San Francisco. Tickets are available at http://cuttingball.com/productions/ondine/ . 5 E's - Loved It – A classic, would see it a second time. 4 E's - Really Liked It – Excellent, strong production. 3 E's - Liked It – Good production but something is lacking or not clicking. 2 E's - Just OK – Below average but had at least one interesting component. 1 E - Did Not Like It – Waste of time. No rating – A work in progress (reading or workshop), or children’s production. "Dirty Dancing: The Classic Story on Stage"
"Champion: An Opera in Jazz"
"The Illusionists -- Live from Broadway"
Roald Dahl's "Charlie and the Chocolate Factory"
"KILL THE DEBBIE DOWNERS! KILL THEM! KILL THEM! KILL THEM OFF!" Goldstar Events - Half-priced tickets or better, SF, San Jose, LA, San Diego, Las Vegas, Chicago, Boston & Washington DC. LiveSV - discount tickets, San Jose & South Bay. Usually half-price. Member of the Artsopolis Network of over 30 cities in US. Vivid Seats - a full-service marketplace that facilitates transactions between fans looking to buy or resell tickets to their favorite sports, concerts, and theater events. BroadwayBox.com - discount tickets for select Broadway and Off-Broadway, also Las Vegas and London. Theatremania.com - discount tickets for select Broadway and Off-Broadway by joining discount list. NYTix.com - discount tickets for select Broadway shows and other attractions. Requires monthly membership fee. Stub Hub SF Bay Area theatre tickets. A ticket marketplace to buy and sell tickets. Broadway.com - Show tickets to New York and London. No discounts. Theatre Development Fund - NYC. Become a member and receive discount info. TodayTIX - an app for buying last-minute theater tickets.